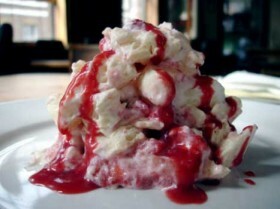 This is my version of good old Eton mess, so easy yet so moreish, the secret lies in really good meringues and very good fruit. I found the combination of small English strawberries, fresh raspberries and blueberries just wonderful. Most of the time though I just go for rasps and strawberries with lashings of a good strawberry compote as in the picture. Add fruit swirl the fruit into the cream and then place covered in fridge till you are ready to make desserts up and serve, as this does not like to be left as meringues go soft. Add a spoonful of the compote over the top, this is so easy and so yummy.